What are you trying to say, Pandora? You are here: Home / consumer alert / What are you trying to say, Pandora? 13 Comments Filed Under: consumer alert, Earth, for self-examination, health and/or fitness, Love in the Ruins, quite possibly funny, Things to discuss with Walker Percy over drinks, up from the comments Tagged With: more like Tele-unmanned amirite? As your doctor I prescribe a walk through a Louisiana swamp. Nothing a Robin Thicke video can’t cure, and much more cheaply. Perhaps, but rather less morally, I fear. While I shudder at the thought of a chemical cantilever, I recoil at the notion of rejoicing over the breasts of a woman not my wife as some kind of aid to intimacy with said wife. Maybe a smart-alecky programmer at Pandora is commenting on your taste in music. This was actually supposed to be the joke of the post: that fans of Telemann were likely to need Viagra – either because they were superannuated or, in my case, because a taste for that sort of music indicated a lack of virility. Hence the Tele-unmanned tag. But the comment on Facebook – “When you throw a rock into a pack of dogs and one dog yelps, that’s the dog that got hit” – obliterated my feeble gag with its raw force. I should note that the other ad I encounter most frequently is for Fiber One snack bars. Fiber is the key to a healthy prostate, so you’re covered … I guess that’s your point. 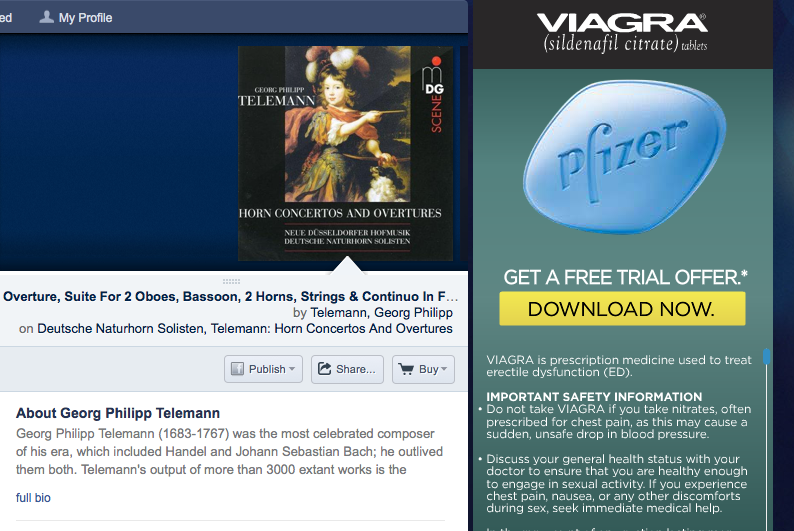 Which composer has ads for Trojans? Wagner maybe? Have you tried Pandora’s “songs to stimulate blood flow” channel? That might open up a box of troubles. I thought the joke was that the waify looking thing on the album cover is pointing her wand (!) at the ad as if instructing us to “Tell a Man!” – with a follow up found in the fact that Telemann, the Dickens of music, was as well known for his prodigious “offspring” as Bach for his.